Boss Jimmy Floyd Hasselbaink has heaped praise on the attitude and ability of Cobblers teenage star Shaun McWilliams. The Town manager is a huge admirer of the 19-year-old, who he describes as ‘a natural’, and says the player’s attitude is spot on and that he has ‘a likeable aura’. Hasselbaink says McWilliams ‘absorbs’ information ‘like a sponge’, and that the player ‘has no idea yet how far he can go, and how good he can become’. The Cobblers boss also says the ‘down to earth’ Northamptonian is the polar opposite of how he was when he broke on to the first team footballing scene with Telstar in the Netherlands. McWilliams’ rise through the ranks has been a pretty swift one over the past 15 months. He has gone from Academy player, to signing his first professional contract to going out on loan to King’s Lynn, to making his Cobblers first team debut, to being one of the first names on the teamsheet. We gave him a new contract because we thought he deserved that. From minute one when we came in we thought he needs to be on more money, and we have structured it in a way, that if he does well then the club has to look after him even more. He is even proving to be something of a utility man when it comes to where he can play, with the midfielder by trade playing the past two games at right-back due to injury - and deservedly winning the man-of-the-match award in Saturday’s 1-0 win over Blackpool. In his short time as a professional at Sixfields, McWilliams has already worked under four different managers, with Chris Wilder handing him his contract. Rob Page played McWilliams in pre-season last summer before sending the player on loan to King’s Lynn, before Justin Edinburgh recalled him and handed him his first team debut, as recently as April 1. The former Soccer Stars and Falcons player has now impressed Hasselbaink, so much so that he recently signed a new and improved three-year deal to stay at Sixfields. Former Holland international Hasselbaink believes the player has a big future in front of him, and that his attitude and work ethic is as impressive as his playing ability. “We like Shaun a lot, from the first moment we came in,” said Hasselbaink. “He doesn’t talk a lot, he is not one of those youngsters who has broad shoulders and think they have done it all, and we like that about him. “He just wants to work, and he has got that likeable aura around him. “Can we help him? Hopefully we can, because we believe in him. We think he is somebody who is really raw, and we are tying to get the best out of him. “Obviously, we are trying to do that with everybody, but Shaun has no idea yet how far he can go, and how good he can become. “We know that he is young, and we know he has gone out on loan last year to non-League and played 22 matches, and then he came back and played five matches here, with three from the bench. “This season he has already played seven matches, so we do need to manage him well. “If we can get 30-plus games out of him, he will have done really well this season. “We think he is going to be a big asset to this squad, especially with how he is, and how he absorbs information, and with how much he wants it. “We gave him a new contract because we thought he deserved that. “From minute one when we came in we thought he needs to be on more money, and we have structured it in a way, that if he does well then the club has to look after him even more. So, how does the 19-year-old McWilliams compare to the teenage Hasselbaink as he tired to make his initial waves in the football world? “I was totally different,” said a grinning Hasselbaink. “When I was 17 I thought I had made it, when I hadn’t. “But it is nice to see that Shaun is just really down to earth. “Back in the day when I was 17, I didn’t have the right support mechanism around me, and having experienced that, I know what I need to give him to have that. 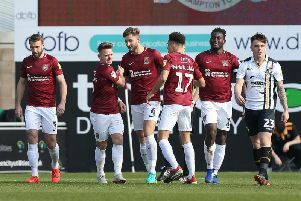 McWilliams is the latest player to come through the Sixfields youth ranks, following on the heels of others in recent seasons, such as Ivan Toney and Michael Jacobs, and it is hoped there are more close to making the breakthrough. Shaun’s 16-year-old brother Camron was an unused substitute in the Checkatrade Trophy match at Peterborough United last month, as was fellow youth teamer James Gillard. And Hasselbaink says he will be happy to give more of the club’s young talent a first team chance - but only if they are up to scratch. “I am Dutch, and in the Netherlands it is the norm to bring youngsters through, but they have to be good enough,” said the Cobblers boss. “They have to be good enough not only with talent, but also the mental side of things. “If they have it, then I won’t be scared to put them in.